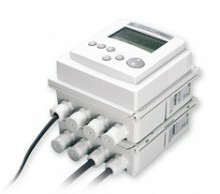 The system 182 of WTW - the ideal single point measurement for waste water treatment plants and industrial applications. At this system up to 4 digital hardware sensors can be connected - thereby, the system 182 is predestined for the use or the extension of an existing measurement location at a waste water treatment plant. Via the field buses PROFIBUS and MODBUS RTU you can send your parameters (pH, ORP, oxygen, conductivity, temperature, turbidity, TSS, ammonium, nitrate, nitrite, DOC, UVT, CSB, BSB, TOC or SAC) directly to the control room. Further, up to 5 analog outputs and 6 relais are available. Click the button below to add the Controller / Transmitter 182 to your wish list.